Societe Generale Valley extended its unbeaten run in this year’s KPMG Premiership to ten matches with a commanding 25-7 win over last year’s league and grand champions Gai Wu Falcons tonight in Happy Valley. With three rounds remaining in the KPMG Premiership, the win gives Valley another leg up in the race for the Top 4 title as the perennial champions have now seen off all three of their competitors in the major premiership in successive weeks to start the new year. It was the Bella Milo show in Happy Valley as the Valley player-coach and ex-Samoan international accounted for all of her side’s points, scoring a try, a conversion and a penalty in the first half to give Valley a 10-0 lead after 25 minutes. Compounding matters for Gai Wu was a stuttering attack that never found its footing against a dominant defensive effort from the hosts, who ratcheted up the pressure on Gai Wu with their significant advantage in possession. The lone bright spot for the Falcons in the opening half came, as usual, from sparkplug winger Chong Ka-yan who turned in a great solo effort for Gai Wu’s only try in the 30th minute. Fly half Stephanie Chan, in her first season with Falcons, added the conversion to narrow Valley’s lead to 10-7 at half-time. It was more of the same in the second half, with Milo converting a 45th minute penalty to push the lead to 13-7. An exchange of yellow cards saw the field open up more and more midway through the second half, but it was Valley, and Milo, that capitalised. Milo did some healthy damage late in the game, scoring twice and adding a conversion in the space of ten minutes to bring the final score to 25-7. Falcons coach Lai Yiu-pang was disappointed in his team’s performance, calling it an important lesson for his side to learn with three games remaining in the league. “We learned another hard lesson tonight and credit to Valley, they played superbly, especially Bella. Defensively, we were under pressure all game, as our attack did not function at all. I don’t think that we learned the lesson from our games with Valley earlier this season so hopefully we learned now. “Even Ka-yan’s try was off of a Valley mistake, pretty much a solo effort, so it was not our attack generating that try. We did not create any real opportunities and that meant that Valley had all of the opportunities and could run at us all day. We just wore down late in the game,” said Lai. In tonight’s other Top 4 game, Borrelli Walsh USRC Tigers beat Kerry Hotel Kowloon 52-0 for a bonus point win that leap-frogs them over Falcons into sole possession of second place on the table. Valley continue to widen the gap between themselves and the competition, sitting atop the table on 13 points. A crucial loss without a bonus point sees Gai Wu fall to third place on five points, one behind second-placed Tigers, who have already pipped Falcons once in the standings this year after finishing as runners-up behind Valley at the end of the eight-team Premiership competition to start the season. Tigers and Gai Wu will face off in a mid-week clash on Tuesday, (19.30 at King’s Park), in a meeting that will go a long way towards settling who will wear the mantle of challengers against Valley in the Grand Championships. Lai knows that his side will be at a disadvantage on Tuesday, having played a physical contest with Valley while Tigers enjoyed a walk in the park against Kowloon. “A loss can be a really good lesson, and I think that after tonight, the girls are looking at themselves in the mirror and realising that we can’t win these games if we don’t replicate the pressure of matches like this in training. “The players have got to change their mentality now and really dig in for the remaining games. I think most of them are realising we aren’t in a good place right now. We will have limited preparation time now for these last three games, it’s all going to come down to our mental preparation,” Lai added. In another pivotal clash in the minor Premiership, Natixis HKFC broke open a nil-nil draw in the final quarter to beat SCAA First Pacific Causeway Bay 10-0. The win keeps HKFC in sole possession of first place as they fended off the challenge from second-ranked Phoenix. Causeway Bay coach Chris Lin was disappointed in the result but positive about future meetings between the two sides before the end of the Premiership. 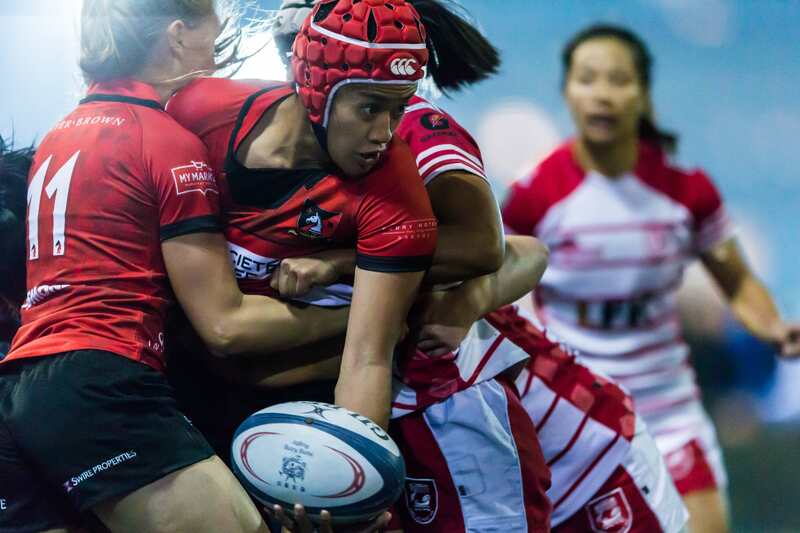 Causeway Bay were intent on marking Club’s main strike force, centre Elizabeth Musgrove, out of the match, and they did just that, keeping the Scotland Sevens star off the board until the final minutes when she scored a try to spark Club’s late kick. “We did well to keep her contained,” said Lin, who also credited fullback June Au for her performance. Entering the final quarter Lin was forced to turn more and more to his bench where Causeway Bay’s comparative inexperience showed late in the game. Phoenix responded positively after Musgrove’s 63rd minute try and the ensuing conversion from Ryan gave Club a 7-0 lead. Their hopes of a comeback were elevated moments later when Club’s No.8 Fion Got was sent to the sin-bin; but dashed just as quickly when Causeway Bay conceded a kickable penalty to give the edge back to Club. Ryan was on from the tee, giving Club the eventual 10-0 win. In other minor Premiership action, winless Plastic Free Seas City Sparkle pushed Transact 24 Taipo Dragons to the limit before losing 15-7. The tense battle was drawn nil-nil through 50 minutes before Dragons broke away in the third quarter with a trio of tries to centre Chan Hiu-tung, prop Vinnci Leung and No.8 Lo Hoi-yan. City never relented and were rewarded for that commitment late when they scored through flanker Yau Pui-yin with Agnes Tse adding the conversion, to give Sparkle a glimmer of hope of at least a bonus point loss, trailing 15-7 with under five minutes left. Unfortunately, they couldn’t build on their total, just missed out on their first point of the competition. The results see HKFC open a healthy five-point gap on Causeway Bay at the top of the table, with 14 points to nine, while Dragons drift in third place on five points, and Sparkle still hunt for their first points of the competition.